Had the Hawker Sea Fury arrived on the scene one year earlier than it did, its place in history would be assured by the outstanding combat record it would undoubtedly have achieved with the British Pacific Fleet in the final struggles of 1945. As it is, the Sea Fury - designed for air superiority - is known for shooting down only one opponent, a MiG -15 on August 2, 1952, by Lt. Peter "Hoagy" Carmichael of 802 Squadron. Given that in the intervening five years between its appearance in squadron strength and that day in 1952 technological development had rendered the Sea Fury obsolete, its victory over the MiG-15 is even more remarkable. Regardless, the Sea Fury is the penultimate result of Sir Sidney Camm's philosophy of piston -engine fighter design. The Sea Fury began life in 1942 with a request by the Air Ministry that Hawker Aircraft design a long -range fighter for operations in the Far East. While a radial -engine version of the Tempest was under development at the time, it was thought that the relatively high wing -loading of the Tempest would be ill -suited for combat with the lightly -loaded Japanese fighters, and thus the Sea Fury started out as the "Tempest Light Fighter (Centaurus)." In early 1943, the designers were directed to adapt the fighter for shipboard operation as well as the land -based role. The first RAF prototype flew in September 1944, while the first navalized prototype flew in February 1945. Tests revealed a need for an increase in vertical fin and rudder size to counter the swing on take -off, while the rigid engine mounts created difficulty until they were replaced with dynafocal-base mounts which completely eliminated the vibration at lower speeds that had hampered the airplane's ability to land aboard ship. While the Royal Navy was testing both the Meteor and the Vampire and had ordered the Supermarine Attacker, there was sufficient doubt about the ability of jets to operate off carriers that - while the RAF canceled the land-based Fury in the face of the arrival of the new jets - the Royal Navy continued to develop the Sea Fury as a shipboard interceptor and later as a fighter-bomber. With carrier compatibility trials completed in 1947, 807 Squadron was the first to convert to the aircraft, followed by 802, 803 and 805 Squadrons between August 1947 and February 1948. The initial Sea Fury Mk.X was quickly replaced by the F.B.11, which could carry underwing drop tanks, bombs and rockets, and the squadrons began to equip with it in May 1948. The Sea Fury's introduction to combat came in the fall of 1950 when 807 Squadron, operating from HMS "Theseus," joined Task Force 95, the Korean blockade force. Operating jointly with Firefly FR Mk IV and FR Mk V strike aircraft, Sea Furies flew from HMS "Triumph," "Theseus," "Glory," and "Ocean," as well as with the RAN from HMAS "Sydney" until the end of the war in July 1953. Following the end of the Korean War, the Sea Fury was rapidly replaced by its successor, the Hawker Sea Hawk, and became the primary aircraft assigned to the RNVR "weekend warrior" squadrons. The Sea Fury was used by the Royal Australian Navy, the Royal Canadian Navy, the Royal Netherlands Navy, the Pakistani Air Force, the Iraqi Air Force and the Cuban Air Force; it last saw combat when flown by Cuban pilots of the FAR against the Cuban exile invasion attempt at the Bay of Pigs in April 1961. In the 1960s it began another career as a civilian air racer, and highly-modified Sea Furies powered by Wright R-4360 engines in place of the Centaurus are among the fastest unlimited-class air racers now competing. There have been at least two 1/72 scale Sea Furies released over the years, one from Frog and the other from MPM that I know of. High Planes models has also released limited-run 1/72 kits of modern Sea Fury racers, and there is a 1/72 FB Mk 11 that will be released by Trumpeter later this year. (There was also the Pioneer Sea Fury, and a vacuform from Rareplanes. Ed) In 1/48 there was a good vacuform from Falcon that is still the most accurate kit in this scale, and one from Hobbycraft that has been widely produced since it first appeared in 1986. Paul Fisher’s 1/32 Sea Fury is generally considered the “definitive” kit of this beautiful airplane. This 1/72 kit by Aki can stand close comparison with the magnificent Fisher Sea Fury in terms of detail and production quality, which is remarkable when one considers this is done in the smaller scale. This kit features posable flaps, open detailed gun bays, and a complete Centaurus engine that can be displayed with the cowling opened. The parts of the kit are amazing in 1/72. The wing is in three parts - upper, lower, and the fuselage fairing, with fully detailed wheel wells, flap wells that have wing rib detail in them, and gun bays as mentioned. The clear resin canopies are as thin as vacuforms; both closed and open options are provided. Decals are for a Sea Fury FB Mk 11 operated from HMS Theseus in the Korean War, which are taken from the Royal Navy Historic Flight’s Sea Fury, and an Iraqi Sea Fury in desert camouflage. This kit, along with the Blackburn Firebrand from the same company, is the most detailed full resin kit I have seen. 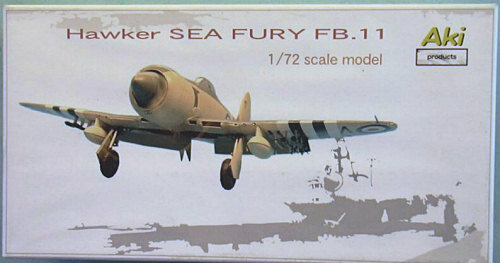 As I said above, it can be compared in quality with the 1/32 Fisher Sea Fury. As with the Firebrand, it is a “fall together” kit in terms of production design, and a modeler who had never built a full resin kit could do this with the full likelihood of producing a show-stopper.